The CP 155-LS two-rail corner-closing ... 3D detail from various angles. Reynaers Aluminium says its well-known premium insulating sliding system CP 155 is now even better and responds to the latest architectural demands. The system is now available with the Concept Patio 155 corner solutions that have made it possible to combine architectural freedom with ultimate comfort. “Together with the smart solutions for easy installation of heavy-weight fixed panels, these extensions assure that the CP 155 sliding door system is an excellent choice in state-of-the-art buildings,” says Ali Khalaf, managing director of Reynaers Middle East, the regional office of the Belgian aluminium systems provider. Khalaf says the key element in creating contemporary living spaces is to have the flexibility to protect occupants against the outdoor climate and to open up at any moment. “The CP 155 Lift and Slide corner solutions allow to open both inward and outward corners, without compromising the system’s known benefits of comfort and insulation. A solution for fixed glass corners to provide optimal daylight and visibility completes the offer,” he says. Concept Patio 155 is a premium insulating slide and lift-slide system, designed to create maximum glazed areas, combined with increased comfort. It can be upgraded to ‘high insulation’ (HI) in order to achieve even better insulation values, which makes the system suitable for low-energy buildings. A specific variant of CP 155 monorail has even achieved the Swiss Minergie component label, the sustainability brand for new and refurbished buildings, Khalaf says. The lift-slide system allows the creation of glazed doors with extreme dimensions and weights up to 400 kg. It also offers an aesthetic minimalist middle section. Additionally, CP 155 can comply with burglar resistance Class Two, offering a safe and secure solution. 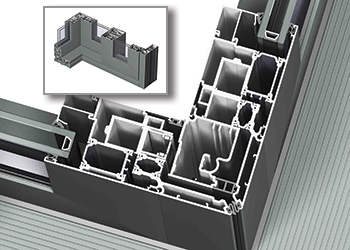 The open corner is applicable on CP 155-LS 2-rail and outside glazed monorail, achieving elevated performance classes for air-, wind- and water-tightness (3 – C2 – 7A). The fixed glass corner can be applied on all CP 155-LS outside glazed monorails, he says. Reynaers says it has responded industry demands for high thermal performance as well as optimum daylighting with its CP 155. Khalaf explains: “High insulating triple glazing implies heavy-weight glass panels. Next to that, living spaces want to benefit from high levels of natural light. Reynaers responds to these needs by facilitating big and heavy glass panes in CP 155. CP 155 makes it possible to achieve large-sized elements with a height up to 3 m and enormous widths, thanks to extension pieces that enlarge the outer frame. A burglar-proof solution (Class RC2) is available both on the inside and outside glazed versions. Furthermore, the CP 155 lift and slide version makes it easy to operate vents up to 400 kg, he adds. Concept Patio 155 is a premium insulated sliding system with elevated performances. The sophisticated concept fulfils the user’s high expectations of optimum quality, high insulation and ease of operation. “Thanks to the ‘high insulation’ upgrade, the system can achieve superior levels down to 1.07 W/sq m K (Uf-value). This results in a glazed element with insulation values lower than 1.0 W/sq m K, allowing the CP 155-HI system, which is certified with a Minergie label, to be used for low-energy buildings. Furthermore, the system is available with a low threshold that creates a perfect continuity between the indoor and outdoor spaces and improves the accessibility to the building. This accessibility and comfort is further improved by the solutions for automatic opening,” Khalaf concludes. Reynaers Aluminium manufactures a wide variety of window and door systems, curtain-walling, sliding systems, sun screening, conservatories, skylights, screens and systems to incorporate blinds and ventilation grids. Established in 1965 and with its headquarters in Duffel, Belgium, the company has offices in more than 30 countries worldwide.